I've just completely lost faith in the showrunners/writers at this point, but let's discuss some of the more interesting moments from this week's installment shall we? Time travel stories have always fascinated me, so the opening scene definitely made me smile. As did the mention of a couple of pop culture time travelers. Speaking of time travel, if you're not watching 12 Monkeys Season 1 yet, give it a shot. It is incredibly well written and smart. I loved hearing Abbie mention that destroying Jefferson's Fenestella was the right move, but they should have grabbed some of the stuff in the vault. That was just one of the things that made little sense in Sleepy Hollow Season 2 Episode 16. Don't get me started on the hologram. Though I wasn't sure why those Sleepy Hollow citizens became possessed, seeing Henry and the Grand Grimoire answered that question. The quake effect was pretty neat I've got to say. Part of me was hoping the book would be used to call upon Lucifer, so it's a bit disappointing they used it to go Hot Tub Time Machine. Jenny was tasked with retrieving the Gorgon's head and using it against Irving if he became a threat. What I liked about this was it made the show feel serialized again versus the procedurals that ruined the larger story arc. Crane also mentioned the sorceress Serilda, Andy Brooks and Solomon Kent. Referencing characters we've met before was one of the highlights of this installment. Magical powers meant Katrina would be appearing any minute, unfortunately. I figured making Kat an evil witch might keep things interesting; boy was I wrong. Sleepy Hollow was always fairly original, but this overused trope now feels like a way to get rid of Katrina. None of it developed organically; rather they're rushing the character off the show after establishing her as a good soul and the love of Crane's life. Anyway, Henry's ritual was meant to identify the ancestors of witches in Sleepy Hollow. I can't believe we've traded in the end of days for a coven of witches wreaking havoc; seriously? Watching Katrina side with Henry against Ichabod was just wrong. It made little sense this late in the game. Didn't it seem like Ichabod gave up rather easily on Katrina? I mean, I totally get what the writers are doing, but it's all so rushed. Including Ichabod saying he would easily kill Henry this time around. Ultimately, Abbie shot and killed Henry which was terribly disappointing. One of the reasons Sleepy Hollow excited me was the fact John Noble would be back on my TV screen. Well, so much for that right? The villain's death did release Captain Irving, so there's that. I'm not sure what the plan is for the finale, but I do like the whole time travel twist. Seeing Abbie standing in the past in her jeans and jacket was just cool. I will admit the season finale is the first installment I find myself looking forward to since the premiere. What did you think of "Awakening"? Do you like where Katrina ended up? Are you bummed out John Noble is gone? Your turn Sleepyheads, share your thoughts with me in the comments. Look for our Sleepy Hollow round table later this week. 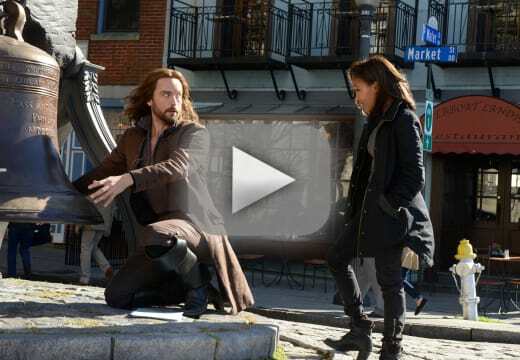 Remember you can watch Sleepy Hollow online via TV Fanatic if you need to catch up before the season finale. NOTE: Sleepy Hollow Season 2 Episode 18 will be titled "Tempus Fugit" and air on February 23.